It’s all over … our is it ??? 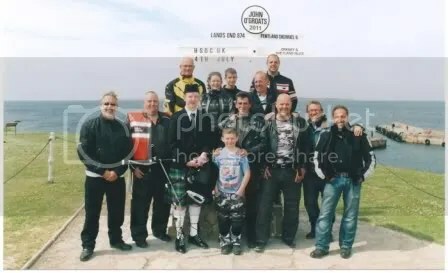 I have always wanted to do a John O’Groats 2 Lands End Road Trip as i think a lot of us would so how about it in July 2011 taking 5 days to do the trip down the A Roads on motorbikes with no mad push & any one that want to join in on our way down can & ride with us for a few miles or for the rest of the trip (You Decide how far you want to go). The nightly stop overs will be at Premier Inn’s as there are loads to pick from on route & they are cheap, clean & you get that hot shower so no need to carry all that camping gear just the things you need & bikers could meet up with us at the Premier Inn’s so that way we should meet most of the bikers that want to join in as we travel from one end of the UK to the other. Well it’s all over So a BIG thanks to all the bikers that made it …. of this great run by the people that made it all happen. A special thanks to Neil B for taking over for me & getting everyone from John O’Groats 2 Lands End.